This is a speech I gave to Engineering Institute of Technology (EIT) graduates on November 23, 2018. From reading about EIT and reviewing some of your award applications, I’m extremely proud to join you in this important graduation ceremony. My own education journey was something of rocky road. I had a severe car accident during my final year of high school so only ended up with one subject, music, which I managed to complete before my accident. I had to complete all the other matriculation subjects a few years later as a mature aged student at the Kalgoorlie School of Mines. I tried to study geology only to be told by the school director: “Mining is finished, you should become something useful like an engineer.” So, I became an electrical engineer. The director was actually quite correct with his comment at that time. I spent the next few years busily electrifying many of the steam driven mine winders around the Kalgoorlie Golden Mile. 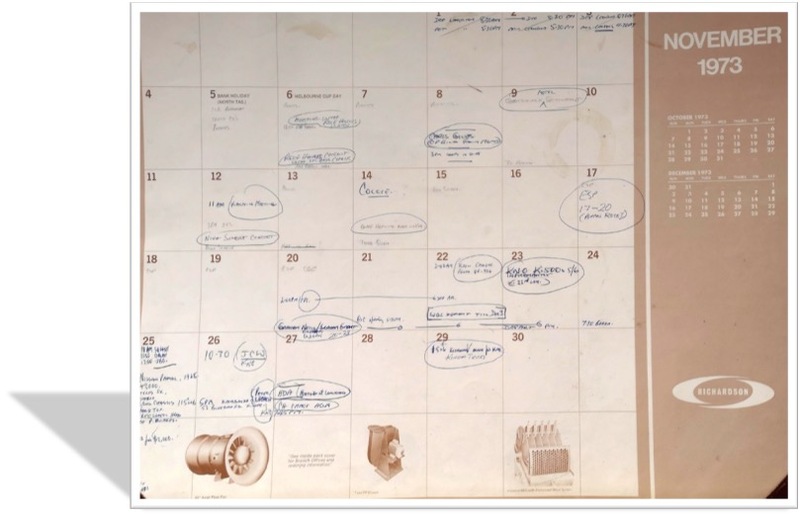 That was about the time they started closing down the mines and, in many cases, transporting the winders and controls to other parts of the world. That brings me to tonight’s topic: why didn’t someone tell me? I’ll reflect on a few things I discovered, by accident, on the way through. I want you to think of life as a very long tunnel. I’m further through that tunnel (or perhaps it’s more appropriate for you to think of it as one large diameter electrical conduit?) than the rest of you. That gives me the luxury of looking back and laughing at so many of my heroic misadventures. I have had some giant stuff-ups in my life, to the extent that my fourth book was actually called Heroic Misadventures. Guess what? I sold out of the book at a profit! (It is now available as a free ebook). It explains how I became a tax refugee from the Australian Taxation Office for seven years. I based myself overseas, embarking on the growth industries of that time, being money laundering, running hotels in Bali and becoming a rock’n roll impresario, before returning to my mining career at the age of 50. After running several mining companies I launched my own, publicly listed, mining company (Croesus Mining NL) and ended up back at the Kalgoorlie School of Mines, studying geology. Today I won’t talk about any of those things. Instead let’s talk about that long tunnel called ‘life’ and conclude with my secret of maximum happiness, sprinkling this journey with a few thoughts that you might find of interest for your exciting careers. 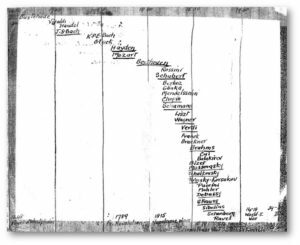 This tunnel of life has created an interesting timeline for me but only recently have I appreciated the usefulness of timelines. 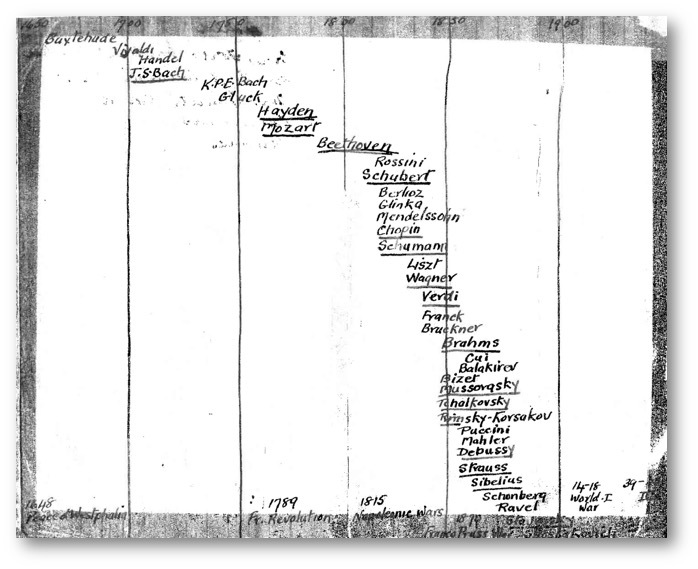 My first exposure to timelines was as a 15-year-old. My mother was alarmed that I was learning music without being introduced to ways the great composers influenced each other. From that point on I have become a timeline nut. 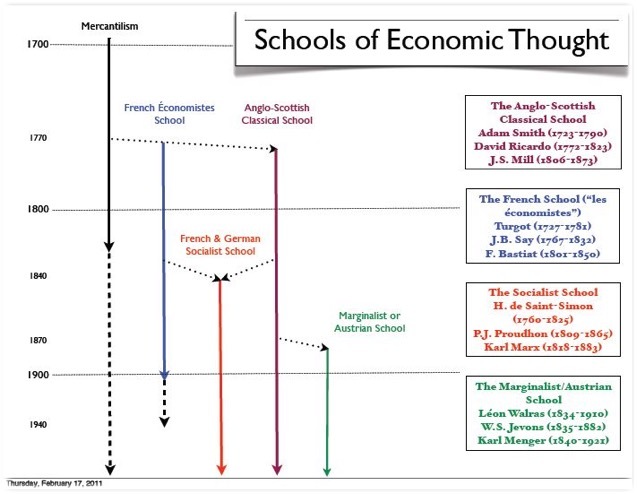 More recently I used a similar timeline to show how the great economists either influenced each other or ignored each other and often repeated the same mistakes, generation after generation. 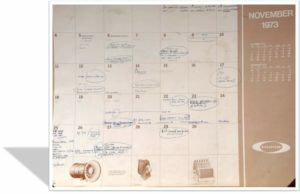 Then, more recently, as I started tossing out some of our many tonnes of documents that I have managed to accumulate, over 82 years, I came across a great heap of diaries or calendars. Less important but still regarded as significant. We could then discard all the rest as static. The two highlighted categories could then be loaded onto a spreadsheet and expressed in graphical form. That would give me the satisfaction of inventing a self-imposed screening process and focus on just what these changes have meant to me. Once you strip out all the static that makes up probably 95 per cent of our lives, we can really appreciate the polished jewels that emerge as truly meaningful. One person (I’ll call him David H) once gave me advice which led me to pick up the phone last year and thank him. Without his off-the-cuff comment of “Ron, I wouldn’t be in a hurry to do that”, I would not have had the firepower to stand up against a very badly behaved Australian Taxation Office, hold my ground and eventually win. At some stage you are going to wonder if I have any words of wisdom to sprinkle into tonight’s event. That reminds me of being asked to speak at a recent wedding in Canberra for one of our favourite Mannkal scholar couples. I suspect I was asked to say a few words about marriage, just because I have been married twice. The assumption was that I might have twice the regular measure of wisdom. I don’t think it works that way. Instead of some wisdom on married life from me, I passed on six points from a fellow called Lao Tzu. All of you know, of course, that Lao Tzu was a contemporary of Confucius, in China, back in the 6th Century BC. Confucius, on the one hand, addressed his message to the “collective”. That is why he is the favourite philosopher of mainland China. On the other hand, Lao Tzu addressed his message to “individuals”, like us, one at a time. That is why Lao Tzu has been described as the world’s first libertarian. Being deeply loved by someone gives you strength while loving someone deeply gives you courage. (Think about that one). Love is of all passions the strongest for it attacks simultaneously the head, the heart and the senses. If you look to others for fulfilment you will never be truly fulfilled. He who clings to his work will create nothing that endures. The wicked leader is he who the people despise. The good leader is he who the people revere. The great leader is he who the people say: “We did it ourselves”. If you realise that you have enough, you are truly rich. On the topic of wisdom, if we skip forward from Lao Tzu, some 27 centuries, it brings us to my bookshelves, bulging with every management book imaginable. If you were to ask me which of those 100 or so books actually made a difference, I would unhesitatingly say, only these two (on the left). 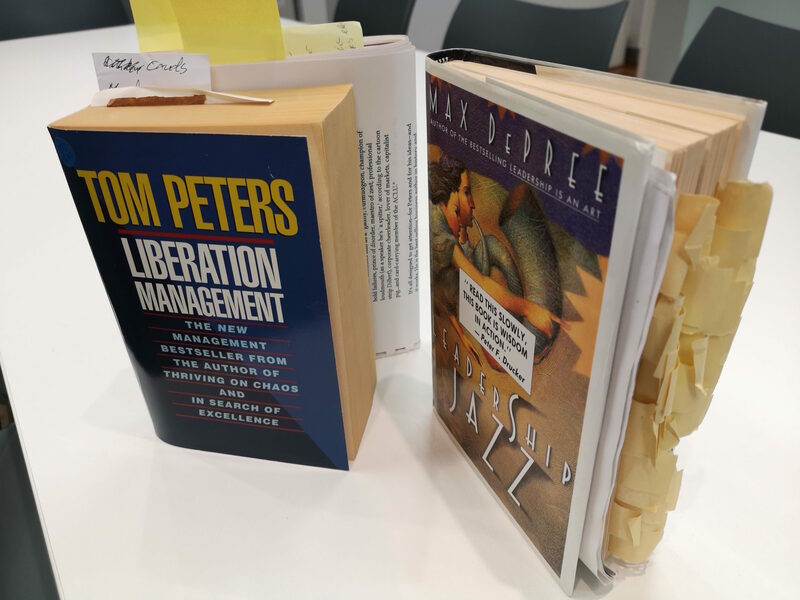 Tom Peters’ Liberation Management personifies the difference between American and European management advice. Americans believe that problems have solutions, whereas Europeans believe that solutions have problems. Peters, heavily influenced by my favourite economist, FA Hayek, understands the use of knowledge in society and how economics is a study of human action, rather than a collection of mathematical formulae. The other book is Max De Pree’s Leadership Jazz. You can see from the yellow Post-its how impressed I was with his description of how an ideal company should operate. Strangely enough, I was doing this three years before the book was published. Let me quote from my 1989 seminar notes to our Croesus Mining team. “Exploration and mining have a natural rhythm, hence the analogy with jazz. What we are doing is like playing in a band. Music means different things to different people but most importantly, deep down inside you, you know when it sounds good — when it all comes out ‘right’. We have an audience. The concerned audience, being 5000 shareholders, and the casual audience that cheers when we play a good note and boos when we foul-up. Each individual member of the band is a star in their own right, but generally we are useless unless we are all playing in the same key and better still when we are playing the same tune. Soloists are good value but they need the rhythm section, the same way that geologists need mining engineers and vice versa, and without the administration and accounting laying the firm foundation of chords, the geologists and engineers wouldn’t be able to play the melody. We must know when to start, harmonise, blend and stop. As band leader I’m useless without every one of you in this band, just as each of you are totally interdependent on each other. You are all star performers and as band leader, I care about each of you — what you eat, what you think, what you read (remember you ultimately become what you eat, think and read). That’s when I reinforced my belief in the ‘flatter-than-flat’ personnel structure which I continue with my 123-year-old family company. As we move toward my concluding remarks let me share with you the concerns of a writer, Darius Foroux, who was recently writing about listing his own ‘useful activities’. He was commenting on doing all those small but useful things every day as it adds up to a life that is well lived. A life that matters. The last thing he wanted to experience was to be on his death bed and realise there’s zero evidence that he ever existed. Foroux commented on a book that he had recently read, Not Fade Away by Laurence Shames and Peter Barton. The book was about Peter Barton, the founder of Liberty Media who was sharing his thoughts about dying from cancer. All of us run the risk of wasting our true potential so we should never miss opportunities as they present themselves to us every single day. Seize each opportunity with enthusiasm and incorporate them into your own BHAGS (as we used to call these Big Hairy Arsed Goals but now, in this politically correct era, are called Big Hairy Audacious Goals). Now, as we move even closer to our conclusion, let me take you back to the early 1960s when I took on the challenge of confronting extreme salinity on some parts of our Esperance farm, in particular one 32-acre paddock which didn’t contain even one good acre. I had read in an overseas farming magazine of a new species of salt-tolerant seed that had been developed in Turkey. This Puccinellia species was said to grow vigorously on salt affected land and its sturdy stem, when trodden by animals’ hooves, created a suitable surface mulch which enabled other plant species to germinate. I managed to import a limited quantity of this expensive seed from Turkey and the planting was so successful in the paddock that I was soon harvesting the seed with a Victa lawnmower hanging off the back of my yellow Jeep (World War II vintage). You never know where your curiosity might lead you! The relevance of this story is that 56 years later I wonder why Western Australia still had a salt problem in our farming areas when this effective remedy is readily available. It was simply curiosity that caused me to follow this matter up in 2006. After some correspondence I actually visited the Department of Agriculture and was called aside by a friendly bureaucrat who explained the simple reason for the lack of uptake of Puccinellia as a remedy to our state’s salt problem. Approximately 40 staff were employed in researching our salt problem and any effective remedy was seen to be a serious threat to their livelihoods. Suddenly, I saw a classic example of the economic theory known as Public Choice Theory (the economics of politics). I was introduced to Public Choice Theory by Professor James Buchanan, a fellow attendee to the CATO Institute’s ‘Transition to Freedom’ seminar held in Russia in September 1990 to train the Russians on how to handle free enterprise as it was arriving the following month. Buchanan and his colleague Gordon Tulloch, with other academics, had developed Public Choice Theory to explain how ‘bad policy’ comes to be adopted politically and is so difficult to eradicate. It also explains how quite often the very worst of people rise to the top. In essence it explains how those individuals who receive the concentrated benefits, work the hardest to bring about the changes that benefit them and they design such policies so that the costs are dispersed over many thousands, sometimes millions, of victims/taxpayers, to the point where because it only costs them ‘several dollars a day’ they are not sufficiently motivated to march in the streets. Once you have mastered the principles of Public Choice Theory or the economics of politics you will see examples of this in every news item and in every submission from vested interests, at all levels, where they all have their own barrows to push. An understanding of Public Choice Theory will explain how politics in most democracies is broken beyond repair. It is always us who picks up the bill but the costs are so carefully spread that we simply shrug and put up with it. 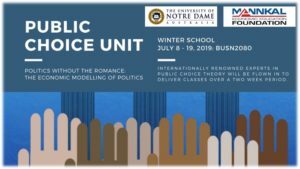 It surprises me that there appears to be only one university in Australia (Australian National University in Canberra) that actually teaches Public Choice Theory as an accredited subject. 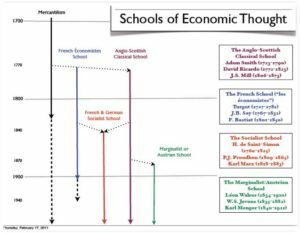 Perhaps it is because this theory may explain how some universities actually operate, where the concentrated benefits go to the administrators and staff and the costs are spread so widely over the students and parents. The teaching of this subject may bring attention to this less than perfect business model. I wish that I had been introduced to Public Choice Theory long before 1990 as it would have solved many mysteries and saved me much wasted time. 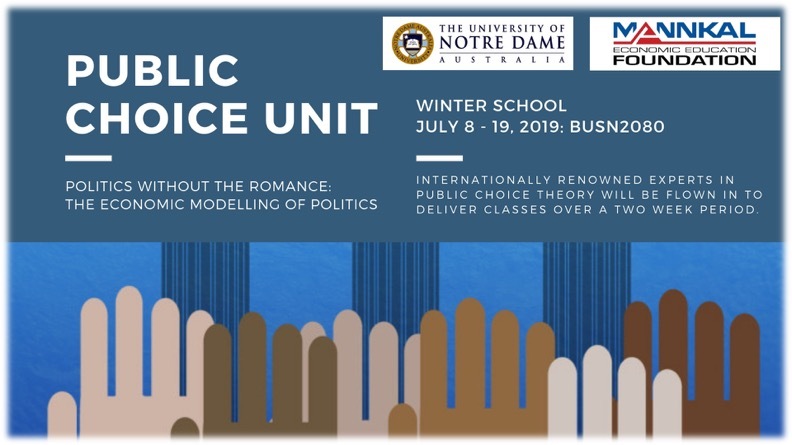 However, to help you and any other curious members of the public, Mannkal Economic Education Foundation is joining forces with the University of Notre Dame in Fremantle and, for the next three years, Mannkal will be sponsoring a fully accredited undergraduate economic unit. We will be flying in world-class experts, to lecture, on this topic. The course will first run from Monday, July 8, to Friday, July 19, 2019 and registration details can be obtained from mannkal.org or via contact with me. I mention this in all seriousness, as the addition of an accredited economics unit like this to your own technical qualifications could be just what it takes to give you the edge on all the other CVs that are lined up in our competitive job market. left us a touch of wisdom. that happiness is merely a by-product of usefulness. of what you can do for yourself and others. Blend these themes together with your own. as we move into 2019.